We live in a connected world. Wi-Fi is everywhere Wi-Fi Aware: What's It About, And How Can You Use It? Wi-Fi Aware: What's It About, And How Can You Use It? What is Wi-Fi Aware and how does it affect you? Let's find out. Read More . A connection here, a new password there, it’s hard to keep track. 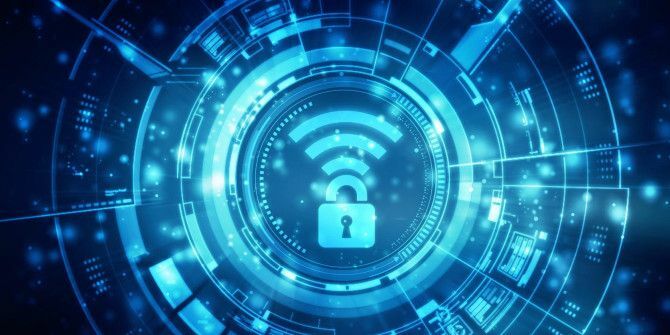 What if you’ve already connected your laptop to a network 3 Dangers Of Logging On To Public Wi-Fi 3 Dangers Of Logging On To Public Wi-Fi You've heard that you shouldn't open PayPal, your bank account and possibly even your email while using public WiFi. But what are the actual risks? Read More , and you want to find out the password so you can also connect a smartphone? Do you need to go ask the network owner for the password again, or can you somehow retrieve that information from the Windows 10 laptop that’s already connected? It’s actually quite easy. First, you’ll need to have your laptop connected to the network in question. From there, open a run box and type “ncpa.cpl.” You can also type that into the Search bar on the taskbar. Now, right-click on the network you want for which you want to know the password, and then click Status. Next, click Wireless Properties in the box that opens. Navigate to the Security tab, then click the check box labeled Show Characters. You’ll see the password displayed on the screen, and you can copy and paste it, write it down, or do whatever you need to do to remember it so you can connect your other devices to it. Since Windows 7 you were able to right click the signal strength icon in the task bar, go to Network and Sharing Center, see the wifi network you're connected to, and then click on it, go to wireless properties, and then security. This won't work for managed wifi connections, such as the wireless connection we have at work, where access is managed through domain policy. But for non-managed connections, such as your home network, or a friends home network, it works fine,.